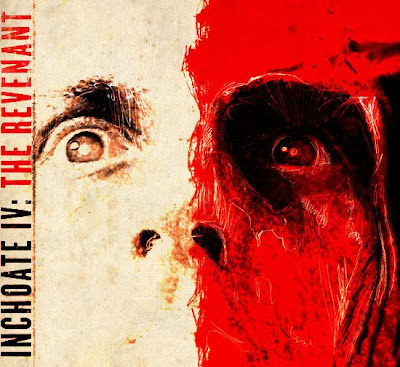 Considering that one man performed, programmed, recorded, mixed, mastered and promoted every sound on IV: The Revenant, and designed the stellar artwork taboot, I'm gonna forgive Inchoate's lone dude Brandon Duncan for forgetting to track vocals. But they would certainly help. They'd help maintain my goldfish-on-ritalin-like attention span throughout the course of the single 32-minute track that makes up the album; they'd provide some interest when his pounding White Zombie via early Don Caballero riffs start wearing thin. IV: The Revenant contains a grab-bag of awesome guitar licks and a bare outline of what to do with them. In between standard riff/repeat/move-on-to-the-next-one-cycles, Duncan slows down, speeds up, shreds, plods -- plenty of peaks and valleys, but with so little counterpoint between bass and guitar; and programmed drums that rarely push the music anywhere interesting, the paths between them feel pretty drab. Divided into more discrete bites, the album might work as a collection of simple, compact headbangers a la Pelican's City of Echoes. Duncan makes us take in his "soundtrack to a fictional zombie movie" as a whole, which just highlights its deficiencies. Duncan's website CorporateDemon.com reveals a compulsively creative artist in a variety of media. As far as Inchoate goes, Duncan's talents lie in the guitar riffs, not the expansive vision. It's a sadly appropriate project name that he's chosen.